Begin by boiling a pot of water for the quinoa. While the quinoa is cooking, you may go ahead and place all the herbs and vegetables in a mixing bowl. The mushrooms must be separately cooked in a frying pan and mixed into the salad bowl. Once the quinoa is cooked, set aside to cool. Prepare the tahini lemon dressing by mixing the yoghurt, tahini and lemon juice thoroughly in a small mixing bowl. Take the salmon sashimi slices and dip them into the soy sauce and brown sugar mixture. Then gently coat them in sesame seeds. (The soy/sugar mixture will caramelise and create a tasty compliment for the salmon). Heat up a frying pan with vegetable oil on high heat and carefully sear the salmon on both sides until the sesame seeds have achieved a lovely golden brown colour. This should take a few minutes depending on the thickness of the salmon. 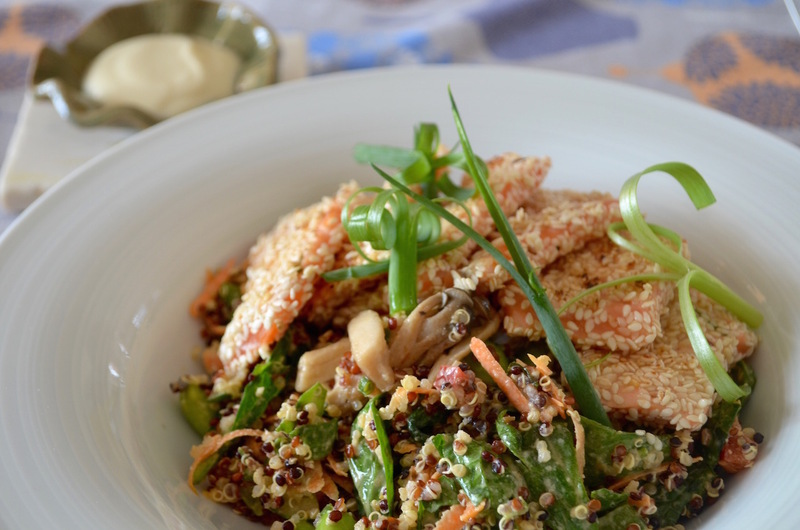 Add the cooled quinoa to the large mixing bowl with the vegetables and stir in the dressing little by little. Top with warm slices of sesame-crusted salmon. 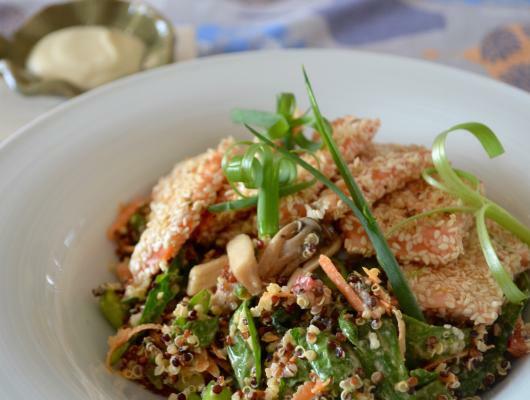 This healthy quinoa recipe can be served with a side of any protein – be it fresh salmon (like here) or some leftover chicken. It is a really versatile recipe that can be adjusted to your taste buds!